Mr. Zocchi is a gaming hobbyist, former game distributor and publisher, and maker and seller of polyhedral game dice. 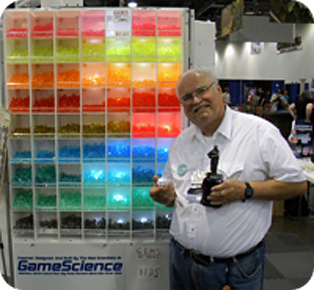 His company, GameScience, became the first U.S. manufacturer of polyhedral dice in 1974. He has invented several unique polyhedral dice. He has also designed and published numerous games. In 1987, Zocchi was inducted into the Academy of Adventure Gaming's Hall of Fame. He was honored as a "famous game designer" by being inducted into the Game Designers Hall of Fame and featured as the king of clubs in Flying Buffalo's 2009 Famous Game Designers Playing Card Deck. Mr. Zocchi will be giving a presentation, "How to Roll Winning Numbers", on Saturday the 11th and will have a booth selling his merchandise including his famous precision dice.